This national affordability chart above employs a different methodology than the CA county charts below: The graphed chart values (percentages) have totally different meanings. The California Association of Realtors recently released its Housing Affordability Index (HAI) for the 3rd quarter of 2017, which measures the percentage of households that can afford to buy the median priced single family dwelling (house). Since many of the figures don’t change that much quarter to quarter, we’ve only updated some of the charts in this report with Q3 2017 data. Year-over-Year ChangesYear over year, affordability declined in every Bay Area county as well as in almost every other county in the state. Note that extremely low affordability readings converged across Bay Area counties at the top of the bubble in 2006-2007. So far, there has not been a similar convergence in our current market, though affordability is generally dropping as prices increase. Most counties now have higher, and sometimes much higher, home prices than in 2007 (see chart later in report), but their affordability percentages are higher now too, instead of lower. The reason behind that apparent contradiction is the approximate 40% decline in interest rates, 2007 to 2016, as well as some increase in median household incomes.Extremely low interest rates have subsidized increasing home prices to a large degree in recent years. Assumes 20% down payment and including principal, interest, property tax and insurance costs. The October 2017 median house sales price in San Francisco surged over $100,000 above the previous peak in May to hit a new high at $1,588,000 (sales reported by 11/5/17). A major factor was that October was a record-breaking month for luxury house sales, and more sales of expensive homes pull up the median price. The median condo sales price, at $1,180,000, was a tad below the recent peak hit in August, and luxury condo sales reported to MLS were well below their peak sales volume reached this past June. The luxury market is covered further down in this report. We prefer measuring median price trends by periods longer than 1 month (which are prone to fluctuate considerably without great meaningfulness), and the below chart illustrates rolling 3-month median price trends for houses ($1,415,000 for August, September, October) and condos ($1,175,000), and 6-month rolling median prices for TICs ($982,500). Remember that median price changes are not perfect measurements of changes in fair market value. And this chart below based on CoreLogic S&P Case-Shiller data compares the appreciation of the more expensive Bay Area home markets (blue line) – such as most of SF, Marin, San Mateo and Diablo Valley – to the overall national trend (green line), going back to 1987. It is interesting to see where our local appreciation rates have diverged from national rates: The divergence since 2012 has been particularly striking. Note that the numbers on this chart all refer to a January 2000 price of 100. So, the latest Bay Area reading of 238 means that home prices here have appreciated, according to Case-Shiller, by 138% since January 2000. National home prices appreciated by 95% during that period. Compared to other Bay Area markets, SF has more small, 2-bedroom houses and fewer big, 5+ BR, house sales – and far more condo sales at much higher prices than in other counties. 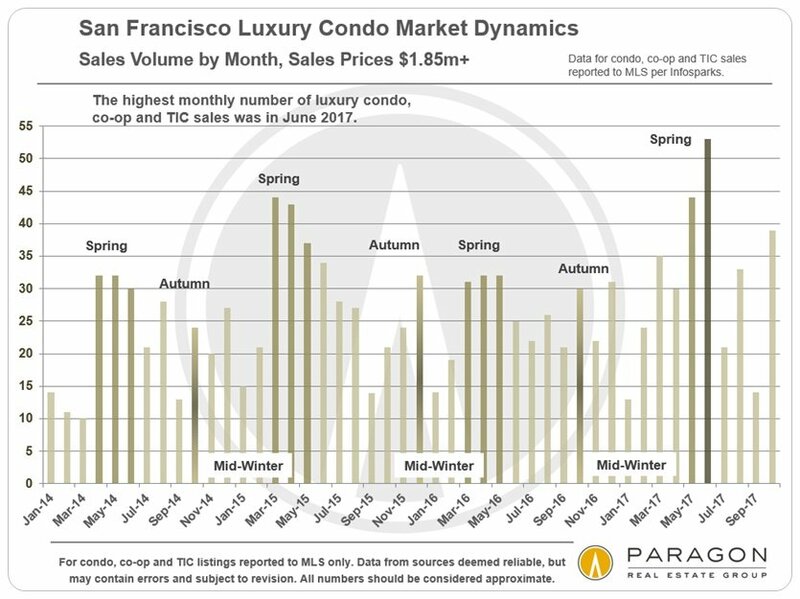 By far the most prevalent SF home sale now is a 2-bedroom condo. As mentioned before, luxury house sales hit a new high in October 2017: In recent years, October has become the biggest month for very expensive house sales. This is not the case for luxury condos, which typically peak in spring. Looking at broader trends in the second chart below, the luxury home market grew dramatically from 2012 through 2015, cooled significantly in 2016 (especially the luxury condo segment), and then surged back in 2017 to hit new highs. But then everything seems to be surging higher nowadays, from stock markets to homes to iPhone prices. On the chart below, South Beach would ideally be divided into two distinct neighborhoods, with condos on lower floors of highrises in one, and condos on higher floors in another (distinctly more expensive). Since that is not easily possible, the median price below is a blend of both. To a large degree, all median sales prices are derived from a blend of a wide range of individual sales, but the highrise dynamic is concentrated in the greater South Beach area. The following charts looks at the various districts of the city by a number of standard statistical measures of supply and demand, or market heat. 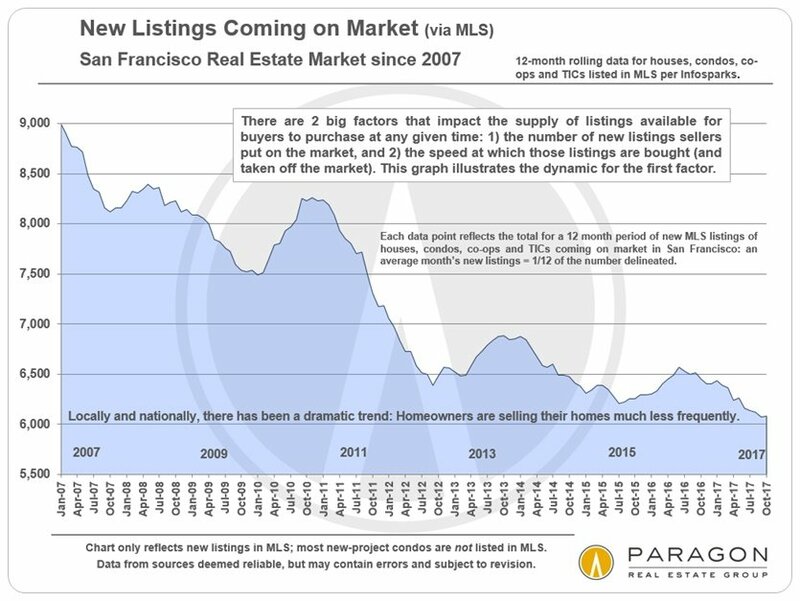 As has been the case for the last couple years, generally speaking, the greatest pressure of buyer demand has continued to be focused on the more affordable house neighborhoods (affordable by SF standards), such as those in the Sunset/Parkside District. Note: These are general statistics and small differences between districts or market segments are not particularly significant. To a large degree, what is seen below dovetails with the analysis by district above: More affordable home segments are strongest, and the affordable house segment in particular has been crazy feverish. The ultra-luxury condo market is, by far, the softest: Part of this is certainly due to competition from new, luxury condo projects coming on market. Just before Thanksgiving the market begins to rapidly subside until starting to revive about 7-8 weeks later. Many buyers simply check out during this period, but there are good reasons for staying engaged – mainly the possibility of getting a much better deal. Starting in October and extending into November, sellers begin reducing prices in large numbers as they try to capture the attention of disappearing buyers: Buyers should treat these as brand new listings and take a new look. Competition between buyers drops dramatically during the mid-winter period, and since competitive bidding is the biggest single factor behind higher prices, its decline can mean significant savings. Fewer buyers also means that sellers are often more willing to negotiate: Throw offers in at whatever price you feel is right and see where they go. It is true that the number of new listings coming on markets plunges, but there are still hundreds of listings to consider for those willing to stay in the game. The dark red lines in the charts below illustrate these big, seasonal market shifts. These analyses were made in good faith with data from sources deemed reliable, but may contain errors and are subject to revision. It is not our intent to convince you of a particular position, but to attempt to provide straightforward data and analysis, so you can make your own informed decisions. Median and average statistics are enormous generalities: There are hundreds of different markets in San Francisco and the Bay Area, each with its own unique dynamics. Median prices and average dollar per square foot values can be and often are affected by other factors besides changes in fair market value. Longer term trends are much more meaningful than short-term. 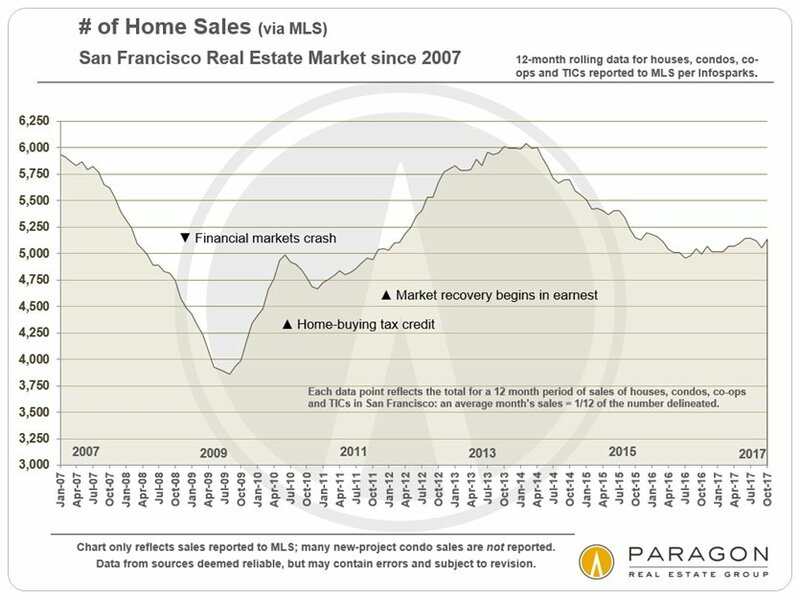 Late-reported MLS activity may change the statistics for the last month in some charts.